Unless you’re a hard-core cyclist, or happen to live in a climate that doesn’t get snow, biking is not high on most people’s winter sports lists. 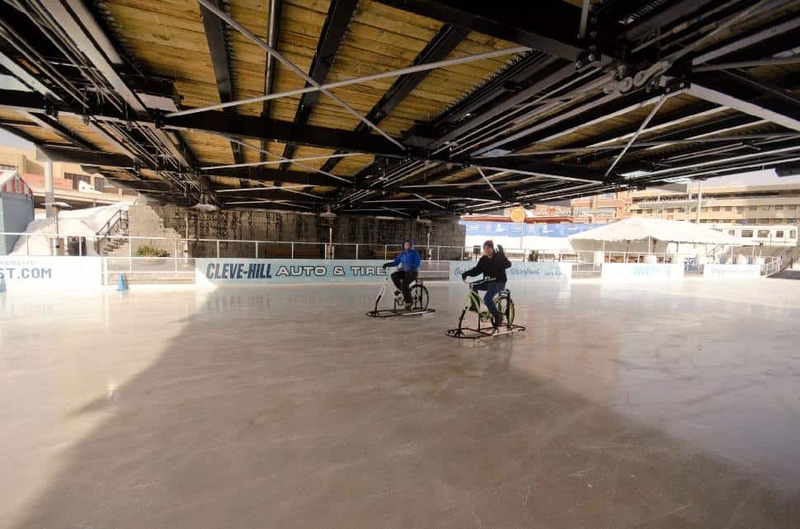 So, while out exploring Buffalo, known for its snowy winters, it seemed like an illogical choice to head towards Canalside with the intention of riding a bicycle in sub-freezing weather. Illogical, perhaps; but also lots of fun! Created by the people behind Water Bikes of Buffalo, the newest winter activity in Buffalo is called Ice Bikes. The concept is pretty simple, put a bit of a sled-like brace around the bike, swap out the front tire for a metal “skate” and you’ve got yourself an ice bike. The sled brace ensures your ice bike won’t fall over, while the front metal blade is used for carving into the ice to help steer. Add a bell and keep it simple with back pedaling / coaster type brakes and anyone can easily get the hang of this funky new winter sport. The sled brace adds a decent amount of weight to these bikes and even if you’re trying hard, the pedal speed has been limited so that you can’t get yourself going out of control. That is probably a good thing for now, as the Ice Bikes are being used on outdoor areas alongside skaters, and you could do a lot of damage to a skater by crashing into one of them with an Ice Bike. I envision these Ice Bikes changing over time, perhaps even becoming a racing sport in the future. They were great fun to ride, and without speed controls, if given a long straightaway or easy, windy trail in the woods, you could get up to some big speeds on these bikes. In terms of effort, on a smooth icy surface they glide great. Very little friction. Despite their weight, after just a couple of pedals you’re on your way. Stopping quickly isn’t very easy, as you’ll glide at least a bit before stopping, but biking along a leisurely pace, with fairly decent turning capabilities means sudden braking isn’t really needed on the Ice Bikes. While these metal skate models won’t work well in rough patches or snowy conditions, a test model with a plastic ski type base turned out to be extremely fast on ice, so if they show up as a future Olympic test sport, count me in! 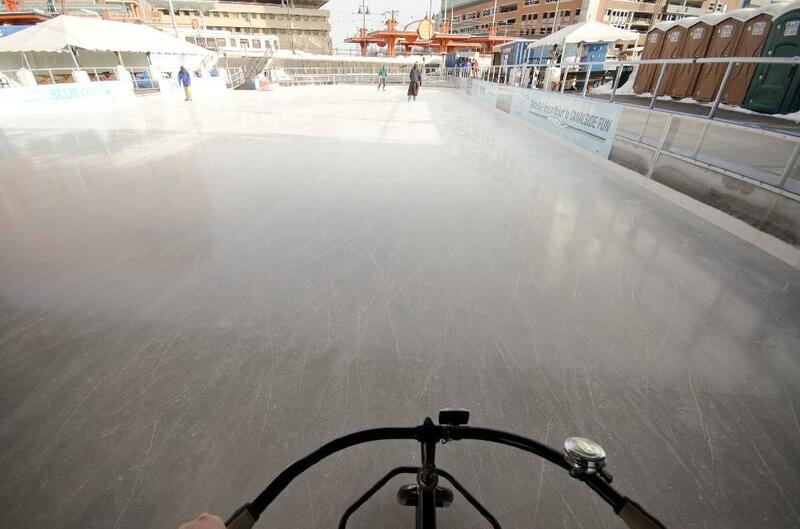 Maybe even some Ice Bike polo or Ice Bike hockey could catch on too? Just like the odd and interesting new sport of bubble soccer, I think the folks in Buffalo are onto something with their Ice Bikes. It’s easier to use than learning to skate, cheaper than skiing and gets you out enjoying the winter. What else could you ask for?